an alcoholic beverage made by the process of brewing (steeping, boiling, and fermenting) cereals (usually malted barley) and flavoured with hops. Origin: before 1000; Middle English bere, Old English bēor; cognate with Old Saxon, Old High German bior, Middle Low German, Middle Dutch bēr, Dutch, German Bier, Old Norse bjōrr, of disputed and ambiguous origin. 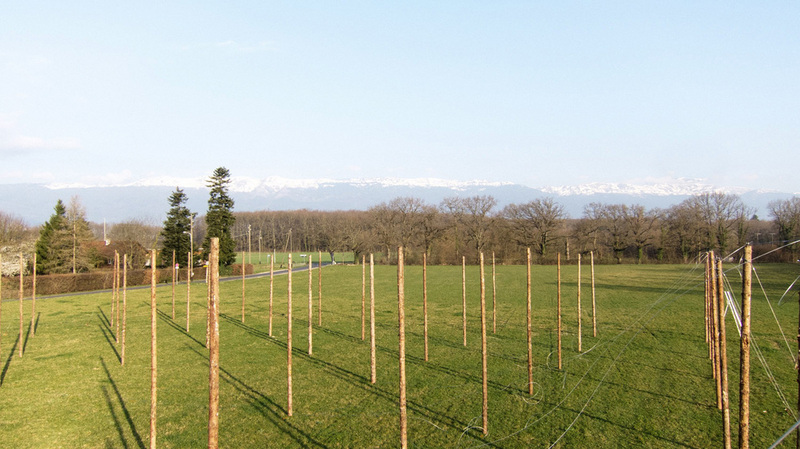 Beer, beverage promoting conviviality and social exchanges, is central to the installation 'champ de bière' created for the inaugural 'Ville et Champs' festival in Geneva. The project site is located near Confignon, at the crossroads of the urban expansion of the Genevese conurbations and the city's agricultural belt. 'champ de bière' reveals the landscapes associated with the production process of this highly consumed product, appropriate to the staging of a festival. From production to consumption, these landscapes are nestled one inside the next. The festivals itinerary route traverses the field providing visitors with a cross sectional view of the cultivation and production process. Central to the site a micro-brewery sits comfortably in a meadow, the meadow is framed by the hop yard structure, the hopyard encompassed by the field of barley, the barley field, one in a cultivated territory, between city and countryside. The project is the result of a collaboration between Architects V-OLZ, Artist Simon Boudvin and Landscape Architects Etienne Haller and Elinor Scarth. Central to the program is the creation of the association ABAG 'Les Brasseurs Artisans de Genève'. This collective of local brewers have been brought together through the 'champ de bière' program and will continue to unite, support and promote locale brewing in the region after the conclusion of the festival. The ABAG brewers will animate the micro brewery throughout the summer season, tasting, sharing their knowledge and experimenting their own personal recipes and brewing techniques on site.